It's reasonably well-known, at least in comics circles, that Jack Kirby was actually born Jacob Kurtzberg. But like so many other creators in those days -- Stan Lee and Bob Kane probably being the most notable examples -- Jacob Kurtzberg legally changed his name. But today's question is: when? GROTH: I understand you got a job with a small newspaper syndicate when you were 18. GROTH: What were you doing for them? KIRBY: I was doing editorials. Like I said I did “Your Health Comes First”. I did another daily comic. On each comic strip I put a different name: I was Jack Curtis, Jack Cortez… I didn’t want to be in any particular environment, I wanted to be an all-around American. I kept Kirby. My mother gave me hell. My father gave me hell. My family disowned me. GROTH: You actually changed your name to Kirby? KIRBY: When I began doing the strips. GROTH: Why did you change your name exactly? KIRBY: I wanted to be an American. My name is Kurtzberg. GROTH: Why didn’t you think Kurtzberg was an acceptable American name? KIRBY: I felt if you wanted to have a great name it would be Farnesworth, right? Or Stillweather. I felt Jack Kirby was close to my real name. "The strips" refer to some of Jack's earliest professional comics work. After leaving the Fleischer animation studios in 1936, he began working for Lincoln Features Syndicate, working on a variety of knock-off strips under a variety of pseudonyms. He went over to the Eisner-Iger Studio in 1938, and worked on both strips and books, again, under a variety of pen names. 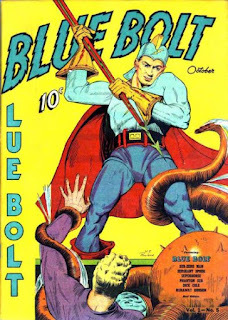 For Associated Features, he drew The Lone Rider in 1939 under the name Lance Kirby and for Fox Features in 1940, he drew Blue Beetle as "Charles Nicholas." The name "Jack Kirby" first appears in print in late 1940 as he and Joe Simon worked on Blue Bolt #5. This would suggest Jack changed his name sometime in 1940 or later, and Mark Evanier's biography of him backs this suggestion up. In fact, he notes that he didn't change his name until after he got married in 1942 and his wife Roz had to change her name too. Further evidence in the book can be found in an October 1943 newspaper clipping that notes that the Jack Kirby who did Boy Commandos is "an army private at [Camp] Stewart, in the 845th Battalion under his real name, Jack Kurtzberg." And it stands to reason he wouldn't change his name while he was still in the army fighting Nazis, so that pushes any legal changes back to July 1945 at the earliest. Well after he'd left doing comic strips and was a marketable name in comic books. So if we're that late into his career, and clearly throwing Jack's own recollection out of the water, that doesn't really answer much. "Sometime after 1945" still leaves almost half a century until Jack's death in 1994. I would guess that the legal name change was Roz's doing, likely after getting yet another check made out to "Jack Kirby." Their first daughter, Susan, was born late in 1945 -- did they have to change her name too, or was that something they took care of before she was born? Here's something I don't get... If he didn't change his name until sometime after mid-1945, that would mean he worked at the Eisner-Iger studio as Jacob Kurtzberg. And yet at no point can I find any reference of Will Eisner saying, "Of course, when he worked for me, he was still going by Jacob Kurtzberg..." or anything like that. Even in Shop Talk, where the two of them are sitting together expressly talking about that studio and their time together there. Maybe my research skills aren't as sharp as they could be, but that seems like a striking omission on Eisner's part. Unless perhaps he was going by "Jack Kirby" for several years informally, and just didn't legalize until sometime later. I know Stan Lee took this approach, changing his name decades after first using the pen name. This might account for why Jack mis-remembered when he changed his name -- everyone started calling him Jack Kirby in the late 1930s, so he was, for his purposes, no longer Jacob Kurtzberg. That it took a few more years (and probably Roz doing most of the paperwork) to get it officially changed was just some paperwork he had to sign. He was Jack Kirby regardless what it said on his tax forms.